Werner's Cairns blog: Riding horses wasn’t meant for everybody! Riding horses wasn’t meant for everybody! Daintree is today a well-known international tourist destination, but back in 1959 only the locals would have known about its existence. The area around Daintree was in the main dairy farming. The village consisted of about half a dozen dwellings and a butter factory. The latter had two employees, the manager and his sidekick, both hands-on butter makers. I lived with my wife, Karola, and our three children on a cane farm at Miallo, about 10 Km north of Mossman in far north Queensland. 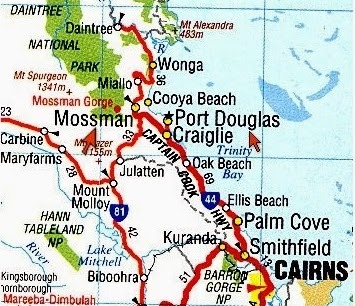 (See map, click to enlarge) The farm was only about one kilometre from the Daintree turn-off. I had a full time job. During the cane season I cut cane and during the “slack season” as it was generally called, I did all sorts of work during that time: repair work, weed control, or making cabinets etc for the farmer's wife. So, “slack season,” was a bit of a misnomer; it wasn’t slack at all; there was always plenty to do. The farmer’s house was a typical Queenslander, with two long L-shaped verandas. In the slack season I had to build a wardrobe with 18 doors. I’m still wondering today what the farmer’s wife wanted to store in such a big wardrobe. The Miallo State School was where our eldest daughter, Sonja, started school, and then eventually became a teacher herself. And, I recall fondly experiencing the wonderful Australian mateship as a member of the Mossman Rifle Club; considering that I was a “newcomer” to this country and only here four years. Read about it. At that time there was no TV and the only entertainment in the far north was the Mossman cinema. Claude, my boss’ brother, and I went there on Saturday night. The seating was very primitive; each seat was a 3 foot wide canvas sheet attached to a high back rail and a lower front rail. The aboriginals from the Mossman aboriginal Mission had to sit in the front rows nearest to the screen. Things have changed since. However, there were all sorts of things we could do in our leisure time. One of them was to go to the Mossman Gorge for a picnic and swimming among big boulders in the crystal clear freshwater, that finished up in the Mossman River. There was also an alternative for me. We had ten horses on the farm and from time to time during the "slack season”, or on a nice sunny weekend, Stan, my boss, his daughter Coral and I saddled up three horses and went for a ride around the cane farm or the area around Miallo. On a few occasions we rode as far as the Daintree River, taking a shortcut through other properties until we hit the beach at Rocky Point, and then following the beach to the mighty Daintree River. This always turned out to be a wonderful excursion. Stan's wife, Roma, a very big woman (dress size 26,) kept pestering Stan to teach her horse riding (poor horse I thought) so she could also come along on our rides. Stan usually found good reasons to resist, (I could think of a couple myself) but one day, for the sake of peace, he relented. After a rudimentary horse-riding lecture by Stan, she was ready to get on a horse – that’s what Roma thought. Being a very big person she wasn't able to lift her foot high enough to get into the stirrup, so a chair was fetched and placed beside the horse. With Stan and Claude, pushing and shoving, while I held the horse; Roma eventually reached the top of the horse, but slid immediately down on the other side. It was of course very difficult for me not to burst out laughing seeing this sorry looking lump of human flesh being “down to earth” again. But Roma was not to be deterred by this little mishap and was determined to have another go at getting on top of that horse. To make things easier for Roma, it was decided to stand the horse beside the farm's loading ramp, so that Roma could just 'walk' onto the horse. Well, this idea, or “loading procedure” where Roma could practically walk onto the horse proved to be successful and she made it into the saddle. I kept my eyes on the horse’s legs as I expected the horse to go down on its knees anytime because of the extreme load. Stan, while holding on to a bridle led the horse for a walk, at snails pace. But Roma called out, “Not so fast! Not so fast! After a few steps, Roma started to realise that the saddle didn't fit her large posterior too well and that it wasn’t as comfortable as her lounge-room chair. She also felt quite insecure on the horse and so high above the ground and wanted to dismount to get her feet firmly on the ground again. So, after a very short ride of about 20 meters, we went back to the loading ramp and “unloaded” Roma. That short ride convinced Roma that horse riding wasn’t her favourite mode of transport and, I’m sure, the horse was pleased about that as well. Life isn't a matter of milestones, but moments. Rose Kennedy. We all loved your story, Werner. We have two horses and our children thought it was funny how you men went about “loading” Roma on the horse. We also enjoyed reading the two stories in the links and we came to the conclusion that you and your family assimilated and integrated very well into Australia’s way of life – not all migrant do this. Furthermore, your children and grandchildren must be proud of you that you recorded narratives of your life. Not many people do this, and thus many good and interesting stories are never told or shared. This is a real Australian story, Werner. The way you explained the whole “procedure” of getting Roma onto the horse was superb, it certainly tickled my risible nerve. Well done. “Horsing around” would have be an appropriate title for this story. I enjoyed reading it, and I learnt a bit about Far North Queensland. I enjoyed reading this story, like all the others; they are always interesting and capture the reader because of the way you write them. I’m also amazed of your command of the English language, which is your acquired language. All this is a great credit to you. Please continue and enrich us with your blog postings. I totally agree with the sentiments expressed by "True Blue Aussie". And, thank you Werner,for keeping us entertained and informed. I would like to add that Werner's blog is like treasure trove. To vaccinate or not - that is the question. Coke; its more beneficial uses. Brigadier George Mansford's True Blue Poems.